Services for searching, downloading and installing NBM with new functionality or updates of installed modules. The provider this SPI can be plugged into Autoupdate's Updates Providers and can supply NBM to Autoupdate Services. AutoUpdate feature provides several services to IDE: download and install available updates of installed modules, search and install new features from subscribed Update Centers, browsing and manipulating the modules in IDE installation and handling of module localizations. To use the services have to AutoUpdate supply a GUI to easy manipulating. AutoUpdate feature has to care about registration Update Centers as well. Several several services means that Autoupdate feature contain several parts of functionality. These part of AutoUpdate should communicate each other. Moreover, some interface should be public. One of them is SPI for Update Center backend - allows to create and subscribe the Update Center in IDE. Next there should be a API which communicate to rest of IDE and provide some services what is useful for NB installers, a non-visual client of Auto Update which make possible to use Auto Update from command line as standalone application in "admin" mode. All of them needs a APIs. This document describes proposed APIs, supposed use-cases and design of interaction Auto Update parts each other. Naming: What is feature? Group of modules which are close connected together and cannot acts separately. I think that feature is common understand notation and fits its matter we will use it from now on. A distributed feature may list a module, which is only available on some update center, in NB IDE case because of licensing issues. This token must be reported so the as part of the UpdateElement and Operation so the caller may initiate the download operation. Added a method UpdateUnit.getVisibleAncestor() which returns a visible plugin which depending upon this unit. Returns a unit if this unit is installed in the system and some of visible units depending upon this one, otherwise returns null. Added a preferredupdate attribute into Update Center Descriptor to specify if an update has to be installed before other updates or not. This flag is off as default. UpdateUnitProvider.getContentDescription() returns a description of content staging by this provider. The description might contains HTML tags e.g. HTML Links. Added a method UpdateElement.getLicenseId() to get ID of license agreement if the UpdateElement has a copyright. This ID could be stored somewhere once an user approves the license and will not be asked for approval again the same license ID. InstallSupport find out the right directory where a plugin should be installed. After that it checks if an user has privilege to write there. In the case a lack of write permission, throws org.netbeans.api.autoupdate.OperationException.WRITE_PERMISSION. Beside this it allows to write into userdir as a fallback in the case of insufficient privilege. 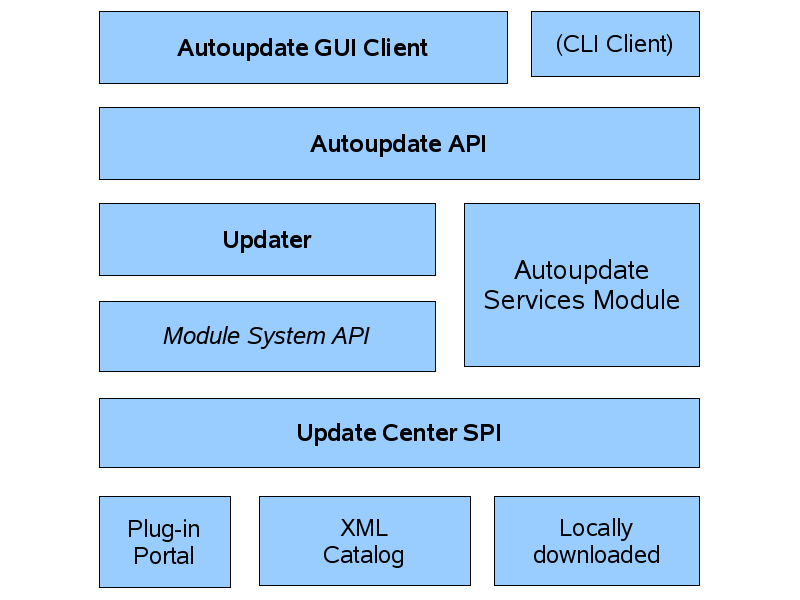 Give overview of IDE installation to users, it involve overview of installed modules (grouped together as feature), overview of available updates, overview of available new features. The API can return list of UpdateUnit which describes all instances of unit, e.g. installation in IDE, all its available updates, optionlly its backup instance. UpdateUnit can represent either a feature (e.g. group of modules), a single module or a localization. Sometimes there can be a need to get overview of units by chosen style, e.g. feature, module or localization. When an API client needs to get overview of installed modules. Proposed usage of API: Call List<UpdateUnit> UpdateManager.getDefault().getUpdateUnits(UpdateStyle style) and filter units which haven't been installed yet. Someone is searching for some functionality which can be installed into IDE. It needs a set of available UpdateUnits which are applicable to active IDE. UpdateManager will search all available UpdateUnit given attribute. An client needs to install new functionality into the IDE installation. She knows what unit and what version wants to install. Needs to identify if the functionality is ready to install, resolve its dependencies, identify possible problems and locate other unit what have to be installed together with asked functionality. Client needs install NetBeans module in required minimal specification version. Find corresnponing UpdateUnit by module's code name and finds UpdateElement what fits the required version. So, the client now have UpdateElement which wants to install. Adds the element into container OperationContainer.add(UpdateElement) and gets OperationInfo for that operation. Check if there is no broken dependencies: OperationInfo.getBrokenDependency() Note: if there are some broken dependencies then operation cannot continue. A client needs to update some unit of functionality which is already installed. She knows what unit and what update element (by version) wants to install. Needs to identify possible problems with update install, resolve its dependencies, identify possible problems and locate other unit what have to be installed together with asked functionality. An client needs to uninstall some functionality from IDE installation. She knows what unit wants to uninstall. Needs to identify if the functionality is ready to uninstall, resolve its dependencies, identify possible problems and locate other unit what will be disabled together. Client knows UpdateElement which wants to uninstall. An client needs to switch off (disable) some functionality in IDE installation. Needs to resolve its dependencies, identify possible problems and locate other unit what will be disabled together. Like Switch off functionality An client needs to switch on (enable) some functionality in IDE installation. Sometimes an client needs to rollback of installed update of unit to previous version. Needs to resolve its dependencies, identify possible problems and locate other unit what are affected by rollback. OperationContainer and OperationInfo identifies some problems, i.e. broken dependencies, needs to install more units, the operation causes disable some other modules and so on. The client can use this information to consult these with end-user. Sometimes need to make whole IDE installation up-to-date. Find all available updates of installed units and install the latest available version. It is covered by previous use-cases. If there is a new Update Center which is not already subscribed into IDE user wants to subscribe new one Update Center which will be connected from that time in periodically checks. There should be a factory where subscribe new one Update Center, known types of Update Center have own factory method. Proposed usage of API: Simply call UpdateUnitProviderFactory.create() which creates and registered new one subscription in the system and will be used from that time in the future. An user wants to enable or disable of Update Center subscription. Proposed usage of API: Simply call UpdateUnitProviderFactory.setEnable(UpdateUnitProvider, boolean). Simple unsubscribe a chosen Update Center from the system. Need to know of chosen Update Provider Id. This Update Center won't be checked anymore. Proposed usage of API: Simply call UpdateUnitProviderFactory.remove(Id). The content of Update Provider is cached and the system works across there caches. There is a cache per each Update Center subscription. The caches are refreshed periodically by the system. But, sometime an user wants to call refresh manually. Proposed usage of API: Simply call UpdateUnitProvider.refresh(). If property is not set (as default) then default tab is choosen due to the UI spec. Each module can control whether it shall be visible in a UI that presents updates, installed modules, etc. This can be done by defining OpenIDE-Module-Show-In-AutoUpdate-Client: false (or true) in its own manifest. This attribute shall take precedence over any default deduced by the UI (e.g. don't show autoload modules for example).